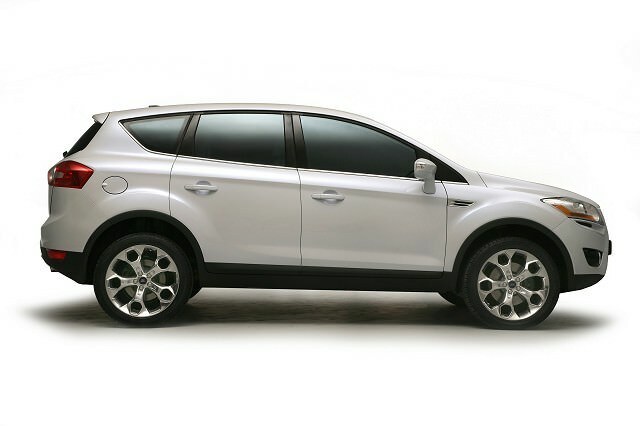 The Kuga was Ford's first proper crossover - it arrived on the scene in 2008. Ford introduced its first proper crossover to the world in 2008, the Kuga using the same underpinnings as the Focus and C-Max, but heightened and offered with four-wheel drive. Sharply styled, it was more expensive than Nissan’s key Qashqai rival, while its relatively limited engine choice also meant it is rarer than its Japanese competitor. Like all Fords of this period the Kuga is among the most fun to drive, with sharp steering, fine handling and excellent body control. Only ever offered as a five-seat model, the first-generation Kuga was replaced by a new car in 2012, coming with a greater choice of engines and a more spacious cabin. It didn’t take Ford too long to follow Nissan’s Qashqai to market, but the Kuga was a crossover that was more SUV in its make-up than merely a tall family car. Useful off road, the Kuga really impressed on it too, Ford typically setting the dynamic benchmark in the class. It’s a fine-looking car as well, still looking sharp today; the chunky four-square stance and Ford’s ‘kinetic’ styling help it stand out from the amorphous norm. The interior is similarly neatly styled, if sometimes fiddly to operate, but space front and rear isn’t great and the boot isn’t particularly sizeable either. The engine line-up wasn’t as expansive as in some rivals, the Kuga offered in 2.0-litre turbodiesel form with either 136hp (latterly 140hp) or 163hp - the higher power version only offered in conjunction with four-wheel drive. There’s a five-cylinder turbocharged petrol engine, too, borrowed from Ford’s fast ST Focus, its 200hp giving the Kuga real pace, if rather unnecessary running costs. Back when it was launched Ford made a big thing about its push button starter, though the Kuga was well specified as standard and featured some clever optional kit - like a power socket that takes conventional household plugs. Plentiful active and passive safety equipment make it a safe choice, too, it gaining a five-star overall EuroNCAP rating, where it also scored well for pedestrian safety. Trim levels included the usual line-up of Trend, Zetec and Titanium, the latter coming particularly well specified, though Trend and Zetec buyers aren’t left wanting for anything. A Zetec 2.0 TDCi model with 136/140hp will suit most buyers. The four-wheel drive Kuga is not necessary unless you’re country-bound and need the added traction it brings. Choose it and you’ll add to the consumption and around 10g/km to the CO2 output. Running costs should be sensible and servicing should be hassle-free on any, though. The Kuga is a typically impressive Ford to drive, though there are a few compromises regarding interior space - the boot and passenger compartments not as commodious as some. A good used buy though, and still a fine-looking car despite its advancing years. A front-wheel drive diesel is the way to go for most buyers.